Harper, T.K. (1990) Wolfwalker, New York: Ballantine. It was dark, and she could not see. She could not hear for the roaring in her ears, and she could not move. Oh, moons of mercy, moons of light… She tried to spit out the panic but choked on grit and fur and dirty blood. Guide me in the darkest night… Struggling, she dragged a breath into her lungs, and then the fright that held her frozen burst and she screamed, the sound suffocating in the black death above her. Keep me safe from evil spirit…….(p.1). Ember Dione maMarin is one of two main characters whose points of view Harper switches between. She also happens to be my favourite. Defying the patriarchy and traditional roles assigned genders Dion has gone all out by being both Healer and Warrior in addition to a Wolfwalker. She and her twin had just started their Journey before it all went wrong. Wolfwalkers are humans who bond with wolves. Because each of them has to adapt to each other, the human becomes wilder and the wolf less wild. Harper made the bond believable – you will see how. Wolfwalker is the first of three novels in the Wolfwalker trilogy and was also my introduction to Harper’s authorship. And I loved that journey. A fun fact about Harper is that she has been through many of the same types of extreme sports as Dion has. She has also been a martial arts performer. I would be fair to say that Harper knows what she writes about, and it shows. Aranur Bentar neDannon is our second main character and male. I’m not certain I ever really warmed up to him. At times he really got on my nerves. This is a man who is used to getting things his way. Most of that has to do with his size, abilities with a weapon, position in society and leadership abilities. Fortunately he is not a bully. Harper did a good job in maintaining their different personalities throughout the story. Obviously, these two will grow into a couple. Thankfully not in an annoying or cloying manner. Group cohesiveness, individual coping methods and thrills are the main themes of Wolfwalker. While we do get to smile at something every once in a while, for the main part this is a grim story where grief, fear and exhaustion are more common. Harper handles both the lighter and grimmer sides of the novel effortlessly (it seems) and maintains her flow throughout the story. She walks a fine line between just enough and too much well and does that through all three novels. After reading her work, Harper has become one of my favourite authors. Each chapter begins with a poem that foreshadows its contents. When I read the story by myself I skipped over them. It’s one of my failings as a reader. That was not an option when I read the story out loud to my daughter (24). I made her read out loud the chapter headings. Turns out I should have read the poems the first time through. I actually enjoyed them. Oh, well. Better late than never. My daughter also gave Wolfwalker a thumbs up and had me begin the next in line as soon as possible. A girl and her wolf. We soon find out that this is a science fiction story placed somewhere on a strange planet. Most of its creatures are strange, deadly and obviously non-Terran. Personally, I’m not sure there are any weak points to the novel – aside from having to buy it used. Wolfwalker seems intended for mature readers who enjoy grim stories. Harper’s writing expects something of the reader and deals with complex issues. I loved it. Go buy it. I often use Thriftbooks. There was nothing for Amber to fear in this fight; the ghost was already dead. Amber is essential to the story of Freya Snow, a girl who was born right before her mother died. Lily bound Amber to Freya as a protector and teacher. Freya awoke the familiar sound of her sister screaming. Although not sisters in a biological sense, Freya and Alice have been sisters in the foster system in England. Alice is the only of the two diagnosed as autistic. Alice’s autism is so obvious that mental health professionals are unable to deny it. Freya is another matter. She falls into my category, and, therefore, it was obvious to me that her suspicion that she is also autistic is true. They are the only people who take each other’s hang-ups seriously and know that meltdowns are not tantrums. She was quiet, bright, and didn’t cause trouble for those looking after her. That was enough for everyone to overlook her trouble making friends, her obsessive nature, and her feeling faint in crowded spaces as “quirks”. It was only because of Alice that Freya recognized a lot of her behaviour as stemming from autistic traits. Freya also happens to be the Hero of Hunt. In typical Hero style, Freya is an orphan, at the cusp of discovering her magic and acts as a magnet for powerful people. Apparently, she has little say over her life. Alice and Freya are about to be parted from each other. Alice has been found by her aunt and Freya will be going to the Big city. Well, larger than the town she is currently living in. She does not expect much of the new family or of the new school. Her expectations will be met but they will also prove invalid. Past experiences do not have to predict the future. She will get a friend. One who is not put off by her behaviour and that friendship sets all sorts of things into motion. Hunt was well-written. Not great, but fun. I liked it enough to get the next book in line, and White‘s writing was much better. Again, it was freaking amazing to read about a supernatural Aspie girl. Talk about breaking stereotypes. Thank you L.C. Mawson. Ron Ripley understands the importance of atmosphere in his story about Shane Ryan. Like most supernatural creatures, ghosts have been used for centuries by story tellers. Berkley Street is full of them. 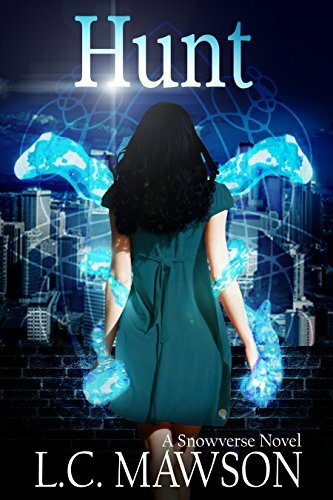 Berkley Street is the first story in the 9-book Berkley Street series. Each novel brings its problem (haunted site) to completion while continuing the overarching story (Shane Ryan’s near-death experiences), leaving us without nasty cliffhangers. The last few pages of the e-book are “Bonus Chapters” that explain how one of the inhabitants of Berkley Street 125 became a ghost. Berkley Street jumps between the time before 1982 when Shane’s parents disappeared and after Shane moved back into 125. The novel can be read as a set of short-stories tied together by Shane’s present day search for his parents. Shane Ryan is overcome when he sees the property his parents have bought. Shane’s parents laughed happily, and he followed them up the front walk. His father took out the house key, unlocked the large door and opened it. Shane stepped into the biggest room he had ever seen. A huge set of stairs stretched up into the darkness, and dim pieces of furniture filled what he realized was a hallway. Close to where Shane stood, a tall grandfather clock ticked away the time. And behind the tick of the second hand, Shane heard whispers. Someone whispered in the walls. The house, itself, is strange. On the outside it was designed to look like a small castle. The inside does not know its own composition. Number and size of levels, rooms, doors and passages changes at the whim of the ghost mistress. 22 years after the disappearance of Shane Ryan’s parents, he returns as a veteran of the US wars in Afghanistan and Iraq. In spite of the many battles he has seen, nothing frightens him as much as his own house. No matter how afraid he is of the house at Berkley Street 125, Shane has fought his aunt and uncle in court for the ownership of “His monstrous familial home.” The only reason he kept on fighting them for ownership was so he could return to search for his parents, who had disappeared inside the house. Fear is a marvellous emotion. It keeps us out of trouble. Well, unless we let fear rule our behaviour. The permanent residents of 125 taught Shane, the child and teenager, how to use his fear to help him. Most of the ghosts cannot stop projecting fear. Except for when the ghost mistress commands them, they are OK people. We get to know German Carl, Italian Roberto, “the ragman” and “the old man” who all died as adults. Eloise, Thaddeus and Vivienne died when they were young. We also meet the dark ones. All the ghosts play a role in the hunt for the whereabouts of Shane’s parents. Not only the dead have roles in the story of Berkley Street 125 and Shane Ryan. Ghosts, Shane’s mother and father, aunt and uncle, Detective Marie Lafontaine, Veteran Gerald Beck, and ex-resident Herman Mishal all reveal 125’s character. Shane’s main opponent is the ghost mistress, the one who holds the heart of the house. Her only wish is to add Shane to her collection of ghosts. Shane and the ghost mistress are both set on destroying the other. Their tactics are extremely different. Where the ghost mistress uses terror to control others, Shane tries a more diplomatic approach. Ron Ripley’s story pressed the right buttons and frightened me. I did manage to finish it. Although The Broken God can be read alone, it is better to read A Thread in the Tangle and King’s Folly first. Some characters hit me harder than others. In The Broken God that was the boy Zoshi. There really isn’t anything unique about Zoshi. He’s just another “street-rat” among many others. Like street-rats everywhere, hunger, homelessness and poverty are his companions. We first met Zoshi in King’s Folly. His plight broke my heart. Zoshi’s story in The Broken God is just as difficult for me to read. “… The light wavered with his shaking. Zoshi gripped his own arm, trying to keep it still. He was falling, he was sure of it, and his stomach had been left at the cave wall. Courage is like that, and I love that Flynn recognizes this. I also love that one of the bravest people in her story is this 8-year old boy who had just been through one terror and now tries to muddle through his another. All alone, except for the dog/mammoth/crow Crumpet. Marsais is a mess. Being at least 2000 years old and a seer will do that to you. His mind travels all potential futures and “endless hallways of memory“. Keeping track of when he is has become almost impossible. His meddling left one of his stabilizers behind. Isiilde did not get on the ship with him. Marsais may come to regret that decision; but like all meddlers, he feels he has done what needed to be done. At least Oenghus is with him. Oen is a rock. Yet even stone can crack. Being without his daughter has also destabilized him. But both men have seriously underestimated Isiilde. A nymph fighting for the humans who view her as an animal is a struggle for Isiilde. Lieutenant Rivan is probably the only one of the Sacred Order who does not. He is also the only man, other than her father, who is not distracted by her presence. Unless you count challenging his faith. Blind faith is a dangerous thing. It is easy to forget that knowledge must have precedence. Rivan viewing Isiilde as equal to humans makes him heretic in the eyes of his Order. He is not alone in questioning old beliefs. Captain Acacia Mael keeps on learning that what her Order claims does not add up with what she observes. In the meantime, healer must become warrior again. Morigan, and the rest of the Isle of the Wise, are beset by betrayal and the Fey. The Fey are phantoms whose whispers invade a person’s mind and leave them incapable of fighting back. Most become mad or die. Morigan does neither. She and Brynhilde are amazing women who do their best for the people they are in charge of. I think that what I liked most about The Broken God and The Legend of Fyrsta series was that while there were a huge number of endings, there were no happy endings. There were, however, new beginnings. Occasionally, death is postponed and, instead, another chance was given. Not to make things over or better than before, but to continue trying to make a go of it. We can’t really ask for more than that. Except maybe strawberries. Absolutely loved it. Definitely recommended. Our narrator describes a family learning to cope with a new financial reality. Their father lost his old job and was now working three jobs, while their mother worked one job, to pay the bills that still kept on coming in. Even though their father is not present in much of the book, Jeffrey Ford still manages to show a man who loves his family passionately and whose family loves him back. But because of his need to work so much, we also see children who view their father as a distant figure. Their mother is clearly depressed and self-medicates with alcohol and The Complete Sherlock Holmes. She seems to be manic depressive, and we get to watch her come down from one of her manic episodes. In those few seconds, I saw the recent burst of energy leaking out of her. As usual, it had lasted for little more than a week or so, and she’d used it all up. Like a punctured blow-up pool toy, she seemed to slowly deflate while shadows blossomed in her gaze. Childhood is such a passionate time. If you have ever seen a three-year old express anger, joy, sadness or love, you know what a I mean. Everything is new and everything is normal. An adult might see a child’s circumstances as horrible, but that child knows of nothing else. As they grow and learn to compare, some of their passion is sloughed off. There are three children in our main character’s family: Jim (seventh grade), narrator (sixth grade) and Mary (fourth grade/Room X). All three seem to be pretty smart with Mary as the probable winner. Her placement in a special class is due to the inability of her teachers to get an answer from her. All three are authority adverse. There is an hilarious episode regarding Jim’s personality/IQ test. All three get this self-confidence from their mother, who allows them quite a bit of leeway when it comes to school. I found myself loving this family. Perhaps Mary in particular (although I probably identified most with the narrator). Mary is a child who follows her own paths. Her friends, Sally O’Malley and Sandy Graham, lived in a closet in her room and sometimes they go to school with Mary in the family basement where they are taught by their teacher, Mrs. Harkmar (all three make-believe). Mary also sports an alter-ego, Mickey. Her math abilities are pretty astounding and all learned while listening to Pop working out his horse races. Those abilities are used to identify the mystery behind the disappearance of Charlie Edison. Poor little Charlie Edison. Lost in the battleground of Elementary (Primary) school. He is first on the list of who Bobby Harweed (bully and coward) beats up. Charlie is, sadly, also on the bully-list of some of the teachers. He does his best to stay invisible. Then one day he truly becomes invisible by disappearing for good. Our three siblings begin looking and use Botch Town as their aid. Botch Town is Jim’s creation. It is a model of their neighborhood made from little bits and pieces Jim has picked up and glued together. Mary seems to have super-natural powers in predicting where people will be and what might happen. One of those predictions is regarding their neighborhood’s recent prowler. Then we have the ghosts. I loved Jeffrey Ford’s writing. Definitely recommended. every sound in the forest was pulled inside her gasping lungs and I was standing in the vacuum. I knew my friends were only yards away but I did not hear their small, fast feet shuffling through the undergrowth. No birds sang and no squirrels knocked winter nuts down into empty trees. Even the shadows stopped crawling across the rocks as the sky held the clouds above in place. unchecked. Her head swiveled slowly, looking past her left shoulder and then her right. Her choked, thin voice cried out to the others. the same vaguely African features as the first, with hair bound into submission by scarves tied in loose knots. Their faces might have been round once, but their skin was drawn back and their wide cheekbones made shelves that shadowed their hollow jaws. Their teeth were exaggerated by fleshy lips robbed of their firmness, and when they spoke to one another it was a terrible sight. Oh, Mae, she’s returned to you. She’s returned to us. eyes. My baby, she said, reaching one scrawny arm to my face. Mybaby. Miabella. Who wants to live forever? Not I. Some people do and this greed is explored in the story about Eden Moore, her convoluted family tree and ghostly followers. 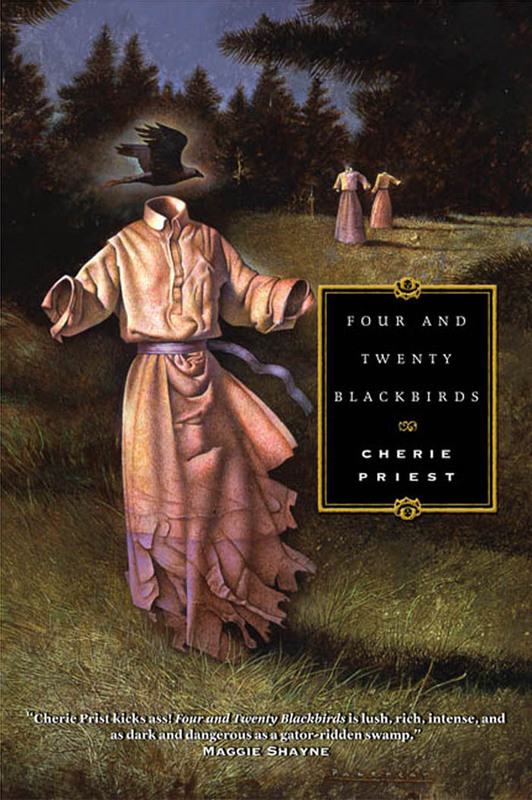 In Four and Twenty Blackbirds the John Gray death-cult uses a dark combination of Songhaien Sorko lore and Seminole lore to bring their founder back to life. Somehow John Gray is tied to young Eden, who we meet for the first time when she is five. Five years old, Eden hears her three ghostly followers speak for the first time with the words in the quote above. As a child, I had no concept of dead or alive, and I imagine my reaction would have been much as Eden’s was. She was used to these women. They were different to other women, but, you know, people! As she grew older, she realized that others considered Eden a bit of an oddity. Apparently, at least until her first time at camp, no other person she met saw what she now understood were ghosts. Cherie Priest is not afraid to tackle serious issues. One of the most serious issues in Southern USA is racism. As a child, I was bullied a lot. So, to some extent, I can imagine what it must have been like for Eden to be bullied for something she had no control over. Some of her class-mates and her pale faced relatives were horrible and on one occasion a co-student made it really simple for Eden to break the rules. Auntie Lulu, Eden’s adopted mother and aunt, keeps the truth of Eden’s ancestry from her in an attempt to shield her. Being the last to know does not make for a happy Eden. But Eden must wait until she is old enough to search for the truth on her own. Works well as a stand-alone, but is part of a series. Definitely recommended. I had trouble putting it down. Definitely recommended! Freaking amazing trilogy!